A coroner has said the death of a woman who was killed by her husband during a violent nightmare was an "extraordinary and unique case". Brian Thomas, 60, admitted killing Christine, 57, in their camper van, but blamed his rare sleep disorder, and was cleared during a trial in 2009. The couple, from Neath, had travelled to Aberporth, Ceredigion in 2008. The coroner said a condition known as "night terrors" led to Mrs Thomas's death. Coroner Peter Brunton, sitting in Aberystwyth, said in the circumstances of this "remarkable, extraordinary and unique case" the only option was a narrative verdict. He said Mrs Thomas died because pressure was involuntarily applied to her neck by Mr Thomas because of a "transient mental condition known as night terrors". The tragedy happened during a summer break when the couple had stopped for the night in a pub car park in Aberporth, Ceredigion, in July 2008, the inquest heard. They had driven from their home in Neath, near Swansea, and eaten out with friends. On the night boy racers had turned up at the car park doing wheel spins and revving their cars. The couple had moved to the upper end of the car park but when Mr Thomas slept the experience triggered a violent nightmare, the inquest heard. He dreamed a man wearing blue jeans and a fleece jacket had broken into the van and was on top of his wife. He dreamed he was grappling with the intruder only to wake and discover he had strangled her. 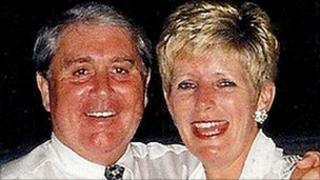 Det Insp Richard Evans told the inquest that Mr Thomas had admitted applying an arm lock to his wife's neck. He was discovered outside the camper van in a "deeply distraught" state after reporting the killing himself. He told police: "I think I have strangled her. I was fighting with this boy but there was no boy, it was my wife." Det Insp Evans said Mr Thomas was eventually arrested and charged with his wife's murder and told the police: "I wouldn't, couldn't and didn't." The father-of-two went on trial at Swansea Crown Court in November last year having already admitted killing his wife. Within a week the trial collapsed as the prosecution decided that no further evidence would be put forward. When the case against him was dropped the trial judge directed the jury to bring in a formal not guilty verdict. The inquest had been adjourned awaiting the outcome of the criminal prosecution.